Financials follow International Financial Reporting Standards (IFRS). The currency is Bulgarian Lev (BGN), pegged at ~€0.5, and trading at ~$0.67. Bulgaria has a 10% flat tax rate. Dividends are taxed at 5%. Capital gains generated on the stock exchange are tax-free. REITs don’t pay income tax. REITs must distribute at least 90% of their net distributable income. Management fees, including board compensation, audit, appraisals, and custody fees, of REITs can’t exceed 6.5% of total assets. Gross floor area (GFA) is one of the confusing, loosely-defined real estate terms. Here, it means the area you get when you spread out a building and count the area of floors and external walls, excluding the roof. It is not one of the best measures out there, but it doesn’t matter because it has been used consistently throughout the annual reports and makes the properties comparable. FairPlay Properties ($6F3:BU) is a Bulgarian REIT, part of holding company FairPlay International. 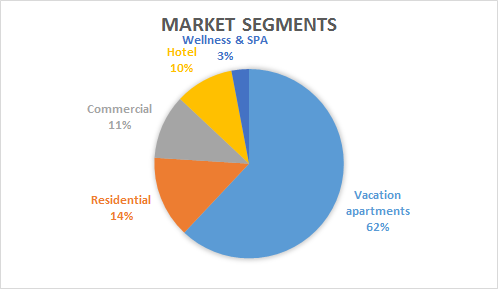 The REIT invests mostly in vacation properties, but also in residential and commercial properties. It was founded in 2005 and became public in 2006. This is a controlled company as 80% of the equity is beneficially owned by Mario and Anna Zahariev. FairPlay Properties is the second largest REIT, excluding agricultural REITs, in Bulgaria. Until March 2011, it was part of the BGREIT index of the seven largest REITs by free float. However, it was taken out of the index because free float dropped below the 20% requirement. The board consists of 3 people – the CEO and Chairman, Manyu Moravenov (pay 104,760; owns 0.03% of the shares), Ivaylo Panov (pay 11,595; doesn’t own shares) and Mariana Doynova (pay 36,758; doesn’t own shares). Moravenov’s background is in the financial industry. He was an expert at the Bulgarian equivalent of the SEC. Afterwards, he held the position of a director at the Bulgarian Stock Exchange until 2005, when he joined FairPlay Properties. In Bulgaria, there are few high profile CEOs, unlike in the US, making it hard to form an opinion about them, apart from what you can read in the annual reports and maybe the occasional interview. Moravenov is no exception. At least, his experience in the financial sphere should benefit the company since raising, and returning, capital is even more important for the operation of a REIT than for normal companies. FairPlay’s flagship project is the Santa Marina Holiday Village in Sozopol, a PR piece on which appeared in the Wall Street Journal earlier this year. It is being developed in stages since 2005. Stages 1 and 2 are completed and 97-98% sold. They consist of 18.5 and 14 thousand square meters gross floor area of luxury apartments, respectively, plus 2.5 and 1 thousand square meters of commercial areas. As the housing bubble kept expanding and the deals got sweeter, in 2007 FairPlay started stage 3. At 64 thousand square meters of luxury apartments, it is twice the size of the previous two stages taken together. It is around 71% completed and 75% sold, according to the 2011 annual report. Back in 2007, when the third stage was started, the plan was to have it finished by 2011. However, due to the material adverse change in circumstances, the deadline has been pushed back to 2014. Expectedly, the crisis caused all projects to be slowed down or halted. In an interview in 2007, the CEO estimated the profitability of the Santa Marina project at 60-70% over 3 years or around 17-19% annually. Stages 1 and 2 were completed within budget – costing around 20m each – and met the profitability expectations. Stage 3, however, will likely run over budget and may not be as profitable as expected due to falling prices and delays. The square meter in Santa Marina villas has sold in the range 2,200-3,700 or 3,000 on average. This price includes 20% value added tax and agents’ sales commissions. For comparison, less luxurious properties in Sozopol sell between 1,400 and 2,200 per square meter. 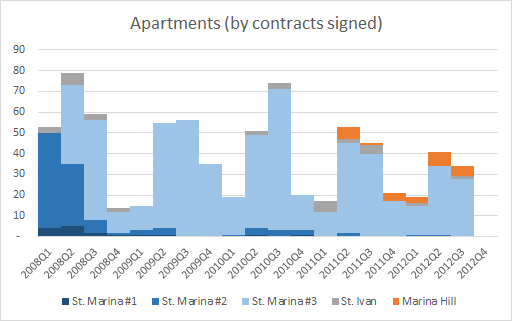 Sales of 143 Santa Marina apartments in 2011 were closed at the average price of 3,000 per square meter. In an interview in 2009, the CEO put the cost per square meter of stage 1 and 2 villas at 1,200. He didn’t give a specific number for stage 3 villas, but mentioned that the cost is about the same – 1,200 but excluding the price of land. Land in Sozopol stands at 250 per square meter in the 2011 annual report. But, even with the cost of land included, the gross profit on every sale is over 100%. Saint Ivan Rilski is currently the company’s second largest investment. It includes 8 luxury villas and a hotel. 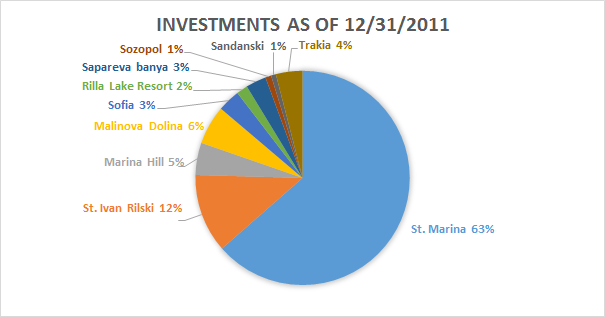 At 12% of the portfolio, still far smaller than Santa Marina – 63%. The project was started in 2006 and fully finished by 2008. Saint Ivan, however, was not nearly as successful as Santa Marina. FairPlay invested 15m in the hotel and 8m in the villas, and expects annual profitability of about 12%. As of the end of 2011, only 55% of the properties have been sold and prices have fallen from an average of 1,500 to 1,000 per square meter. Asked why the project is not doing very well, the CEO gave two reasons: 1) the problems with the infrastructure in Bansko and; 2) the overbuilding, which causes prices to fall. The first problem comes from the fact that not so long ago Bansko was just another small village in the Pirin Mountains. It started becoming popular only 10 years ago, but just in time to ride out the real estate bubble. Many investors, entrepreneurs, and foreigners were drawn to the little resort and it grew on steroids, resulting in too many buildings, and too few roads and green areas. This is a common problem at Bulgarian resorts. Sunny Beach is a prime example. Overbuilding there turned the tiny appendage to Nessebar, the formerly larger resort nearby, into a concrete jungle with a huge summer population of cheap-alcohol-fueled teens from all over Europe. Eight projects make up the remaining 25% of FairPlay’s investments. Below is a summary of all the company’s announced projects. Management’s plan is to continue expanding the St. Marina resort in Sozopol by finalizing stage 3 and 4 and eventually starting stage 5. Effort will be put in completing the Rilla Lake Resort in Panichishte by 2014. They are also working on and negotiating the possible realization of the projects in Malonova Dolina, Sofia, Trakia-Plovdiv, and Sapareva Banya. St. Marina has been the company’s most successful project – selling the most apartments at the highest price per square meter. However, I find it concerning that FairPlay relies for over 60% of sales on one project. It makes the company look like a one-trick pony. Especially when the third stage was larger than the two previous stages taken together and there are plans for a fourth and fifth stage. How many similar villas in a rather limited area can you build before buyers start losing interest? It is questionable whether any of the other projects will become as successful, especially now in the context of perpetual austerity all over Europe. Moreover, the company is mostly in the vacation home and hotel business – a sector that depends on some measure of economic prosperity. Russians and Ukrainians like the Black Sea and Bulgaria as a holiday destination, because the culture and language are similar, many Bulgarians speak Russian, and prices are low compared to the living standard in larger Russian cities. I couldn’t find any official statistics about the nationality of vacation home buyers in Bulgaria. However, I recently read somewhere that currently 90-95% of the sales of vacation homes on the Bulgarian seaside are done with Russian-speaking clients. Before the burst of the real estate bubble, Britons were the largest buyers of real estate in Bulgaria, accounting for up to 60% of sales, from what I have read. They are net sellers now. This brings me to the obvious role of foreign direct investment in the economy and in the real estate sector, in particular. FDI, reaching over 30% of GDP in 2007, fueled the economy and the real estate bubble. After the pop, it shrank over 8 times – from $13+ billion in 2007 to $1.6 billion in 2010. A decent chunk of that money went into vacation homes. After rising over 3 times in 10 years, real estate prices in Bulgaria have fallen 38% from the peak in Q3 2008. The price of existing flats now averages 884 BGN/sq.m. New vacation properties, of course, command much higher prices than this average. But even with this in mind, FairPlay has made very modest revaluations to its properties. I find it peculiar that the company booked a small positive revaluation (IFRS allows upward revaluations) in 2009, when prices were mostly falling. The first downward revaluation, came in 2010, at 3 million. Another one followed in 2011 – at 4 million. In 2010 and 2011, the REIT carried properties worth 124 and 114 million on its books. So, we are talking about a 6% revaluation in the context of property prices falling anywhere between 20% and 50%. Real estate agents are making the point that the luxury real estate market has dynamics of its own and in this segment prices have remained relatively unchanged despite the crisis. I can agree, to some extent, that luxury vacation homes target a group of people not so much affected by the crisis. Nevertheless, the huge price drop justifies, for me at least, a more conservative attitude, expressed in larger impairments. The market, however, doesn’t seem to agree with me. Look at the graphs. After the sharp drop in 2009, prices, based on contracts signed, of FairPlay’s properties have mostly bounced back to their pre-crisis levels. Apartments sold, however, have declined a quarter to a third from peak levels. The traditionally strong summer season has lost steam. While at the peak 120-150 apartments were being sold in the second and third quarters, now this number is down, below 100. This year was particularly disappointing with only 75 contracts signed. Recovery in the demand for vacation homes may not bounce back any time soon. In addition, the crisis in Greece is driving prices of vacation properties there down and Greece certainly has a lot to offer as far as tourism goes. Property prices in Greece have fallen 20-50% from their peak. My quick comparison shows that prices of vacation properties are in the range 3,000-6,000 BGN/sq.m. This is still higher than the average of 3,000 for Santa Marina. But considering the situation in Greece, vacation home prices will be going further down in coming years. The situation is similar is Spain and Portugal. At some price any asset is cheap. Notwithstanding the threat of falling vacation home prices in troubled countries, the relatively low impairments taken, the slowing sales, and overreliance on the Santa Marina project, FairPlay’s is an attractive investment idea based on price. In late 2008, the price crashed and it never recovered. Meanwhile, the NAV stayed pretty stable. Today, FairPlay sells at 0.25 – 20% of NAV. I already mentioned some of my concerns with the company. One was that I don’t think management was conservative enough when impairing the company assets. However, even taking a super conservative 50% impairment on all assets brings the discount to 40% of NAV. This is a decent margin of safety to accommodate for the remaining risk factors. As a REIT, FairPlay distributes at least 90% of its distributable income every year. Distributable income is calculated by adjusting net income for certain non-cash items. FairPlay paid out 0.33 per share in 5 years – 80% of it in 2007-2008. One positive development from the crisis is that the company was able to cut its indebtedness by more than half due to the slowdown in business. Now, debt is 30% of equity and 20% of total capital. While bank financing is very common in Europe and Bulgaria, it doesn’t make much sense that short-term bank loans account for 80% of debt unless the company is having problems acquiring long-term financing. If this is the case, it will become obvious very soon. Between November 2012 and March 2013, the company has to payback or refinance 11.78 million out of its 13.72 million short-term bank loans and 1.31 million current portion of its bond due in August 2014. There is just 0.16 million in cash and all the cash flow from operations for the first 3 quarters of the year has gone towards debt repayment, just as in the past 3 years. It is doubtful whether the company can come up with the 13 million without resorting to forced asset sales. More on this later. Net current asset value is 0.36 per share. However, this measure isn’t very useful for REITs. The classification of apartments as current assets is questionable. They are inventory that won’t realize anything close to its book value is a fire sale, if a fire sale is even possible. FairPlay has been profitable 5 out of the 7 years it has been a public company. The two losing years were the ones when property impairments happened – 2010 and 2011. Profit before impairments has always been positive and has averaged 0.06 per share. The profit margin after all expenses – operating and financial – but before impairments, has averaged 11% in the past 6 years. This year, it has recovered to 10% after averaging 3% in 2009-2011. Cash flow, after investing in new properties, has averaged 0.02 per share in the past 6 years. But you have to keep in mind that the first years (for which there is public data) of the REIT coincided with the real estate boom years. The company was heavily investing in acquiring new properties because the market was steaming. As investment slowed down and stopped, cash flow averaged 0.24 per share in the 2009-2011 period. So, between full investment and no investment, true cash flow to the owners is somewhere in the middle or ~0.13. I have already covered my biggest issues with the company. Here is a quick summary, plus one addition. Very slow recovery of the market for vacation homes. Prices of vacation homes in Greece, Spain, and Portugal becoming more attractive. Over 60% of sales come from the St. Marina project, which is in its 4th stage, and management still counts almost entirely on this one successful project. Debt coming due in late 2012 and early 2013 may prove to be hard to refinance. Possibility of dilution. At the start of November, FairPlay announced a shareholder meeting on December 6, 2012 to vote on the issuance of new debt – 3 million at 7% – and the authorization to raise 50 million equity capital, valid for 5 years. The last two points are the real deal-breakers. FairPlay has to refinance 13 million coming due in the next 4 months. There is not enough cash or operating cash flow to do it. Banks have tightened lending standards. Thus, it seems logical that the company will try to place a new bond. Three million won’t meet its lending needs, but maybe the rest will come from rolling over the bank loans. Another possibility, also to be voted at the meeting in December, is raising new capital. Apart from the dilution issue, there is one other problem. The par value of FairPlay’s shares is 1. This is the lowest par value under current laws, as far as I know, and any new stock issue has to be priced at or above par. This means the market price has to rise 4 times to reach the minimum issuance price. While it is entirely possible that the price rises to par in the next 5 years, it more than likely won’t happen in time for the maturities. This makes it a strange idea. As I mentioned in the beginning, FairPlay is a controlled company. Mario Zahariev and his wife beneficially own ~80% of the shares. I have no idea about their intentions for the company. It will be a dirty trick, but it is possible that the majority holder pays 1 for the new shares, dilutes the small shareholders, buys them out cheaply, takes the company private, and gets back his investment plus full control of the company. True, they have control even now, but this could be a cheap way to acquire the remaining 20% of the company and take it off the exchange. After all, FairPlay today is a 14 million company and trading volumes are miserable. Year to date, between 1,000 and 10,000 worth of FairPlay shares have changed hands monthly, with an average of 4,600. Acquiring the remaining 2.8 million worth of shares on the market will take a very long time and/or will push the price much higher. the costs associated with maintaining a listing on AIM are now disproportionate to the value provided by the listing. FairPlay is obviously super cheap. However, the uncertainty about its immediate future makes the risk associated with the investment too high. The possible squeeze-out, freeze-out, or dilution, and the lack of more information about the CEO’s and the owner’s plans about the company doesn’t give me confidence that the odds are in my favor. As much as I don’t like it, after spending a long time researching the company, I won’t be taking a position. I will wait for the meeting in December. I won’t mind if the company delisted from the exchange. If it can finance itself without much dilution, showing that it cares about the minority holders, I would gladly buy and hold a decent position. – You say it is the 2nd biggest REIT. Which is the biggest one? – What is the business model? As far as I can see it the business model is one of building and selling the properties. Which should be a pretty miserable business, now that there is a huge oversupply. – Are there some other REITs which follow an alternative approach of buy/construct-and-rent? Compared to current market prices rental yields should be really attractive. Much more attractive and interesting than building and selling new property !!! Or am I wrong to assume that property prices have come down more than property rents? If I look at the prices in bulgarianproperties.com then I have to say that the portfolio valuation of Fairplay is completely unrealistic. Most properties have come down in terms of value by 2/3, and a lot of rather new property is sold for €500/sm. So they will likely have to book huge losses in the next 1-2 years. But this also depends on the contracts that have been made with current buyers. As far as I can see, they have sold some of the property before they started with constructing the new houses. If I were one of these buyers, I would really try to get out of these expensive contracts (that still reflect high pre-crises prices) and buy something else much more cheaply somewhere else. By the way. I had a look at a similar company. TMM Real Estate from Ukraine. Listed in Germany. Interesting stuff. I just checked their latest report. These guys have around a third of their assets in property (retail and holiday homes; 23% and 10%), one third in investment land (32%), and one third in cash (34%). There is almost no debt. The retail property is rented out on a long term basis to a french retailer (DIY markets), with a gross rental yield of around 10%, which is not bad I guess (page5). Concerning the holiday homes which are in the mountains, which they want to sell, they are in a bad position. They just do not find any buyers. (And I guess something similar will happen to Faiplay.) The investment land is just there in Sofia, close to the new bridge in Vidim and on the sea shore. Some investment has already been made, but further development has been suspended, given the current oversupply in the property market. The P&L is positive since the cash is generating some interest and the retail space some rental income. 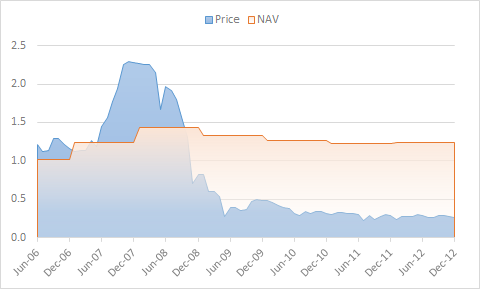 In terms of NAV, the stock is at 0.52Leva, and the NAV as of page 15 of the current report at 0.608Leva. Looking back it looks like the Management was very clever to sell a lot of assets in 2008 at high prices in order to pay back debt and to create the cash position they now have which they have basically maintained (apart from paying out quite some rather large dividends for Financial Year 2011 in June 2012 – which I think was stupid). In sum. We basically have a company that sits on a lot of land and cash and that can wait until the market picks up. When this happens, the land should become much more valuable and it should also be possible to generate significant income through developing the land. Seems to me much more attractive than a company that has to sell their finished properties into a declining or stagnant market in order to pay down debt. Looking forward to discuss these ideas with you. Expat Beta REIT looks more interesting as well. They have really bought a lot of property for cheap. Unfortunately I cannot look at the P&L since it is only in Bulgarian. Sorry for the late reply, but I still have to find a way to track comments because I am not checking my blog every day. Let me attempt to answer your questions. 1. Has the company been delisted? No, the company was just excluded from the BGREIT index. It is listed with tickers 6F3 and FPP. Here are quotes from investor.bg and bse-sofia.bg. 2. You say it is the 2nd biggest REIT. Which is the biggest one? I think you already found the biggest one – Bulgarian Real Estate Fund (BREF). But this list excludes agricultural REITs. There, I think, Advance Terrafund (6A6) and Agrofinance (6AG) are the biggest ones. 3. What is the business model? FairPlay relies heavily on securitizing and selling properties. Around 90% of revenues are generated this way. However, renting has grown from 3% in 2008 to 8-9% in the last 3 years. I think management is starting to realize the potential of renting as an alternative. But, I haven’t found any information about the rental rates the company gets. I will prepare a historical graph of rental rates throughout the country these days. So, check again later. 4. Are there some other REITs which follow an alternative approach of buy/construct-and-rent? Most follow a mixed approach, but I don’t know if there is one purely focused on rental. If there is, I would expect it to be active in the commercial property segment. Residential renting is still not very popular in Bulgaria. 5. Most properties have come down in terms of value by 2/3, and a lot of rather new property is sold for €500/sm. So they will likely have to book huge losses in the next 1-2 years. Properties at the seaside resorts haven’t fallen nearly as much as the average for the real estate market. Looking at the same site (bulgarianproeprties.com), vacation properties in Sozopol go for an average of 1,000 EUR/sq.m. I found only two in the 550-600 range. Santa Marina claims to offer a more luxurious experience than any other in Sozopol at an average price of 1,500 EUR/sq.m. This is somewhat high and I agree that prices will have to come down to attract buyers, but not by much. 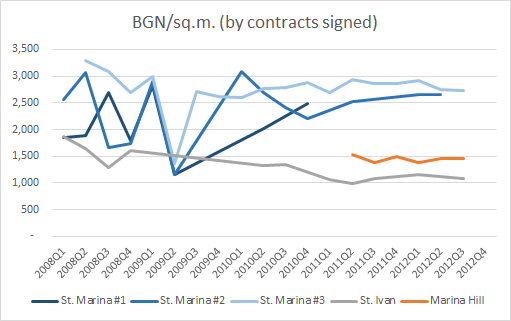 Despite the decrease in volume, prices per square meter of contracts signed after the crisis have stayed very stable. Larger impairments may be necessary on properties outside Santa Marina. 6. What about this company [BREF]? BREF attracted my attention as well and I will do a post on it one of these days. But I think you got the wrong number on NAV. It should be 1.2, not 0.6. 7. Expat Beta REIT looks more interesting as well. I like that they don’t have any debt, but it doesn’t seem particularly cheap at 1.1 of book. I’ll take a look at their properties. Thank you for starting off the discussion. Maybe we can continue over email. That way I won’t be so late with my replies.